This section will look at the Monday Night War. In September of 1995, WCW decided to go head-to-head with WWF’s flagship show, Monday Night Raw. 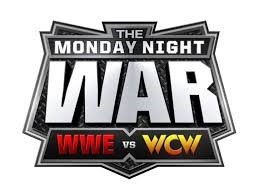 The Monday Night War continued until Vince McMahon purchased WCW, in March of 2001. Since this is a WWF/E Site, I will not keep track of wins & losses for WCW, but this section will show the results of every episode of Nitro and the episode of Raw that went to head-to-head with it. It’s hard to do what segment went head-to-head on both shows at the same time, since the shows are edited on the Network, & there’s no way of knowing when a commercial aired, or if anything else aired at the same time. As more episodes of Nitro are added to the WWE Network, this section will be updated. To see other facts about Raw, then check out the History of Monday Night Raw elsewhere on the site. If a show was preempted, it is listed as such for that week. But if the show aired on a different day, since it was not head-to-head, it will not be listed. 9/4/95 – Series Premiere of Monday Nitro and airs 9-10, against Raw, which also airs 9-10. 5/27/96 – Monday Nitro becomes 2 hours & airs 8-10 ET, while Raw remains airing at 9-11 ET, so only the 1st hour of Raw & the 2nd hour of Nitro went head-to-head. 11/4/96 – Raw moves to 8 ET & airs 8-9 ET, only going head-to-head with the 1st hour of Nitro, which remains 8-10 ET. 2/3/97 – Raw becomes 2 hours & now both shows air 8-10 ET. 8/4/97 – Raw moves to 8:57 & airs until 11 ET, so now Nitro’s 1st hour is unopposed, while they go head-to-head from 9-10 ET. NITRO: [AIRED AT 7 ET for 1 Hour due to NBA Basketball airing at 8] The Dungeon of Doom (Konnan & Hugh Morrus) defeated Public Enemy (Johnny Grunge & Rocco Rock), WCW Cruiserweight Champion Syxx defeated Rey Mysterio Jr. to retain the title, Lord Steven Regal wrestled Meng to a No Contest, Jeff Jarrett defeated Alex Wright, Glacier defeated Lizmark Jr.